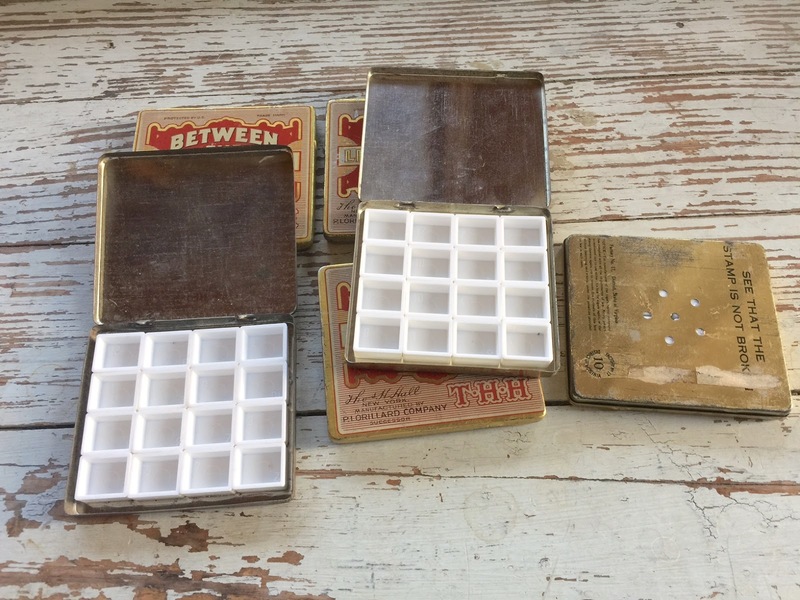 My favorite way to carry my tube watercolors now is in these vintage tin palettes. I've just added a new batch to the shop. 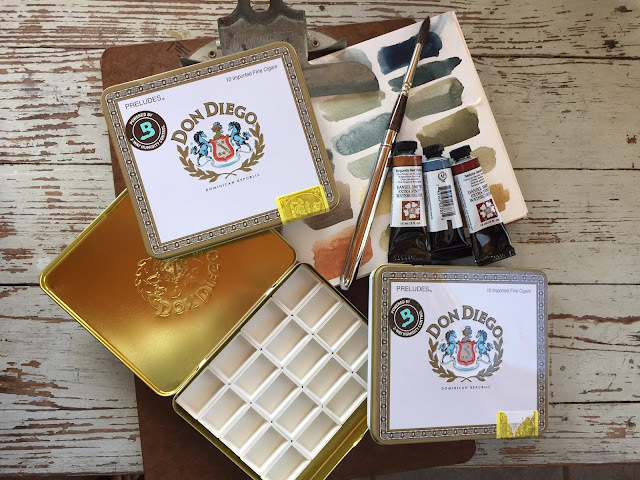 Just fill with your favorite tube watercolor paints. You can find them in my shop HERE. Please follow along with my Instagram account for more recent art updates and to see what I'm up to. My account name is MishWooderson. Just added to the shop + CLASSES! Hey there, hope you are enjoying the weekend. 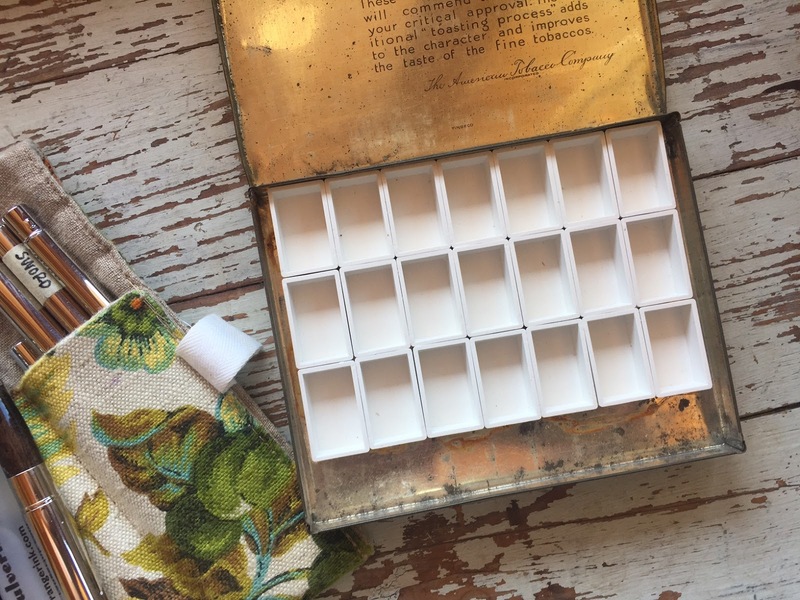 I have just added some new Travel Sketch Rolls and Vintage Paint Palettes to my shop. Both have been selling quickly over the weekend. 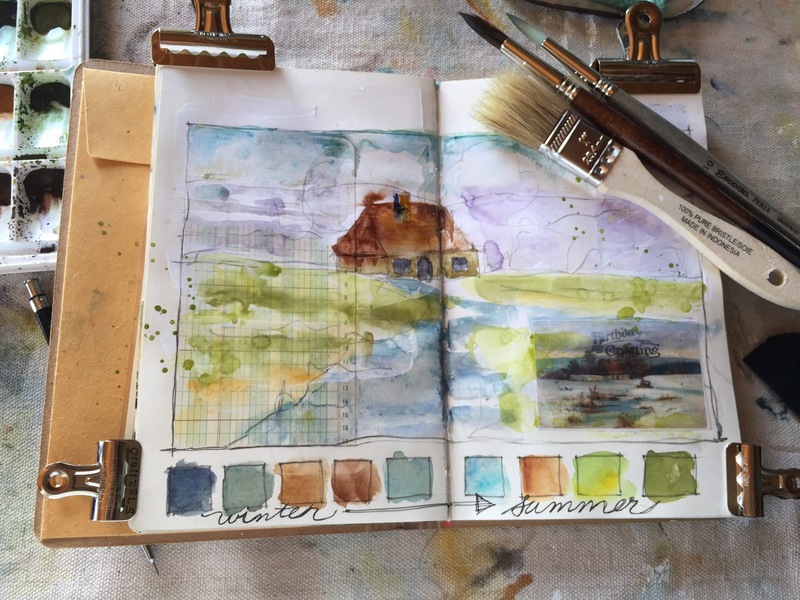 The Travel Sketch Rolls have been a popular item for those taking my Close to Home: A Watercolor Landscape Journey class over at Jeanne Oliver's website. You can see all about the class here and registration is still open. We've been having a blast on the exclusive Facebook page where we share our work, ask questions and network with other artists. 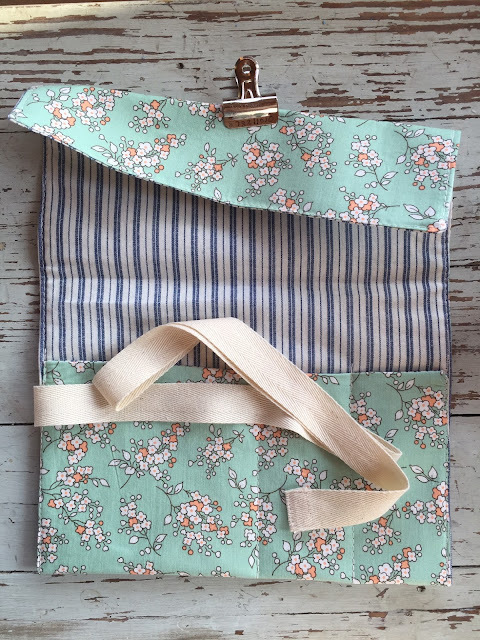 I also have a live class happening at Jeanne Oliver's studio this month. 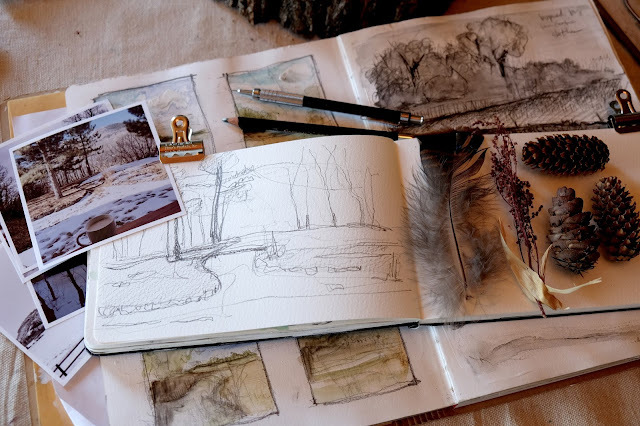 It's called Field Guide: A Nature Inspired Sketchbook. It's a one or two day workshop and it's going to be fabulous. I would love to have you join Jeanne and I in her beautiful studio and paint right outside her back door in beautiful Colorado. 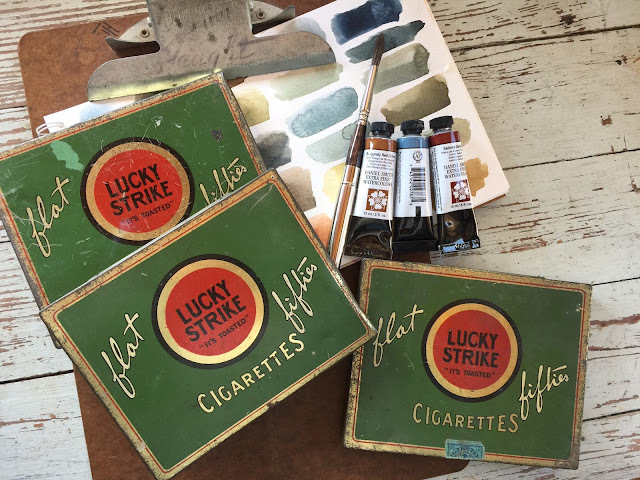 The vintage paint palettes are a fun way to add some old time charm and character to your travel art bag. They come with empty pans that you fill with tube watercolors. 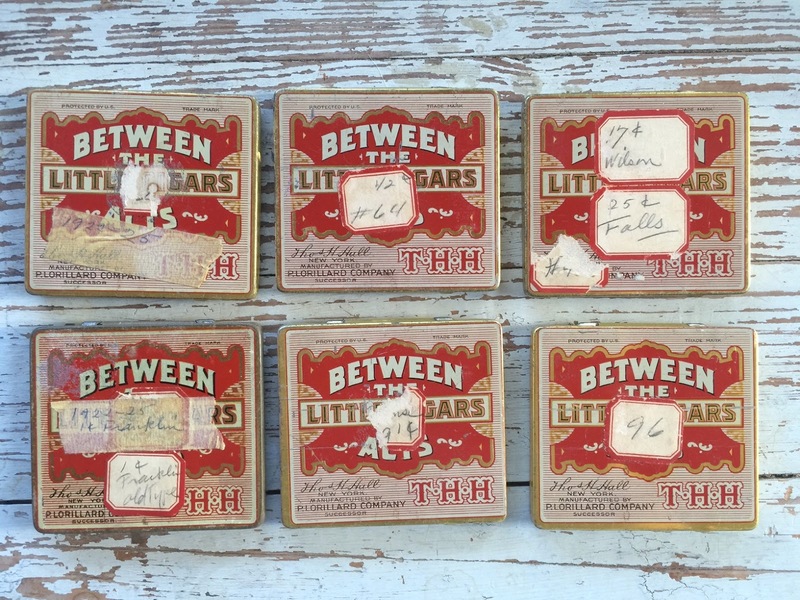 I especially love the vintage red office labels on these. 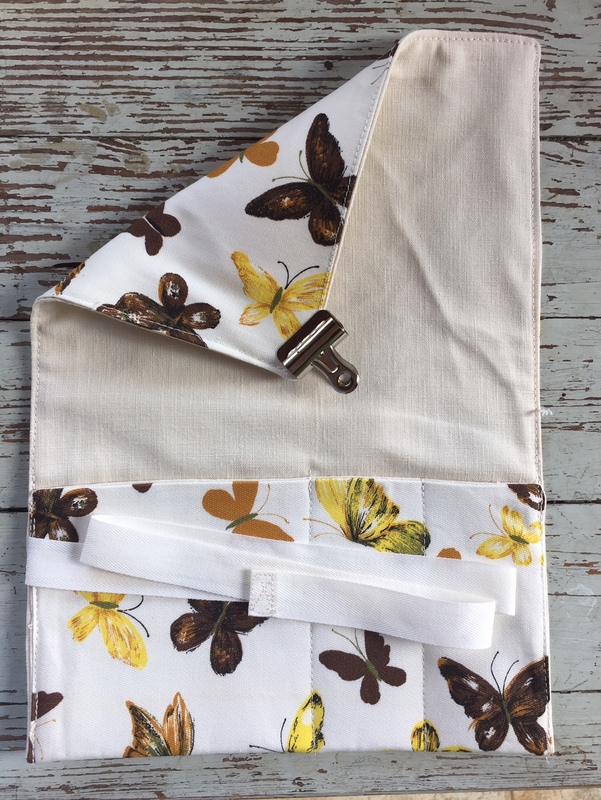 Happy shopping and I hope to see you in class....online or in beautiful Colorado! 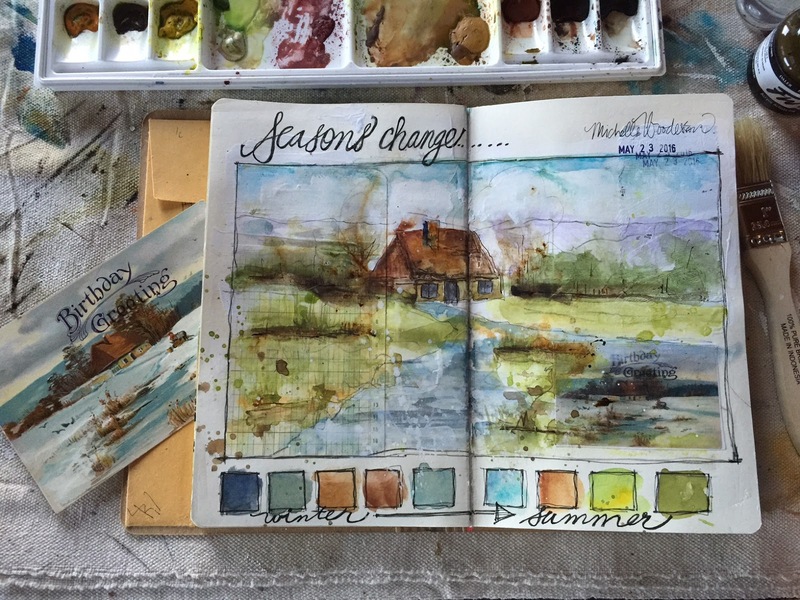 Seasons Change Mixed Media Artist Journal Page..
Hello friends. If you haven't visited in a while, I'm hosting two classes with Jeanne Oliver. 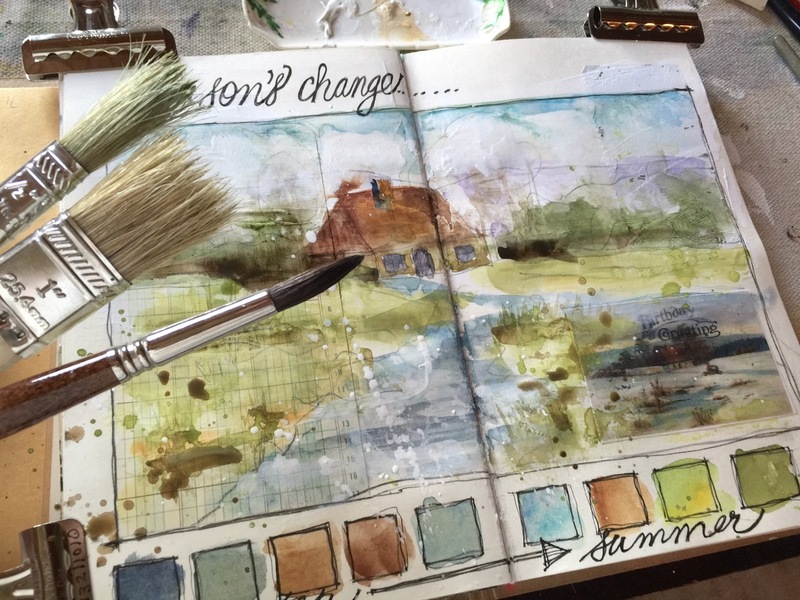 One is an online class called Close To Home: A Watercolor Landscape Journey. The other is a class at Jeanne's beautiful home and studio in scenic Colorado, coming up in September. 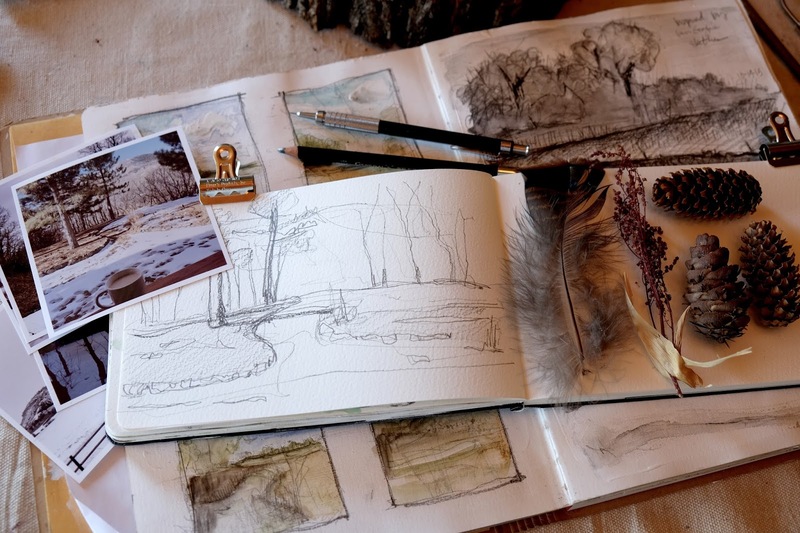 It's called Field Guide: A Nature Inspired Sketchbook. 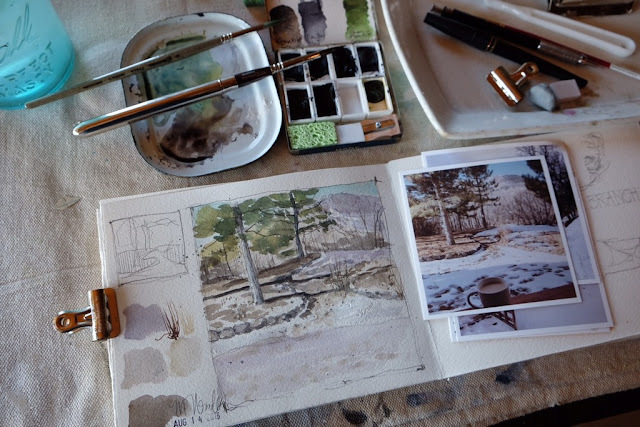 We'll be learning more about sketching and watercolor and will be taking our supplies outside to sketch scenes from Jeanne's beautiful land. Both classes are going to be jam packed with tips to jump start your art. 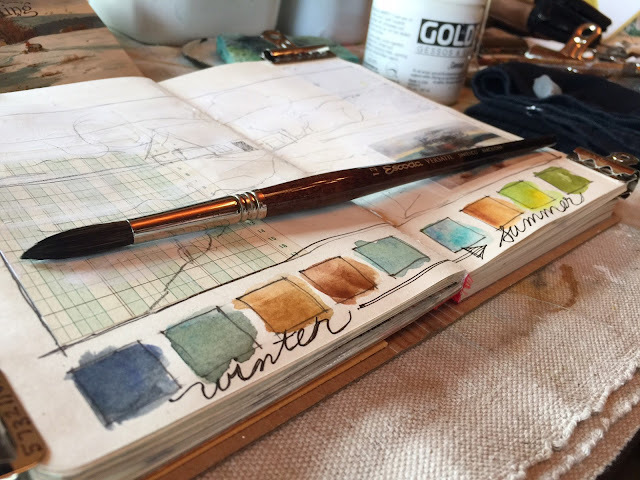 We'll learn about sketching, watercolors, setting up a palette, supplies, and taking it all outside. You can learn more about each class by checking out the blog post links I've provided above. 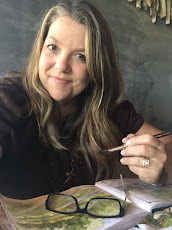 I'd love to have you join me in this creative journey. 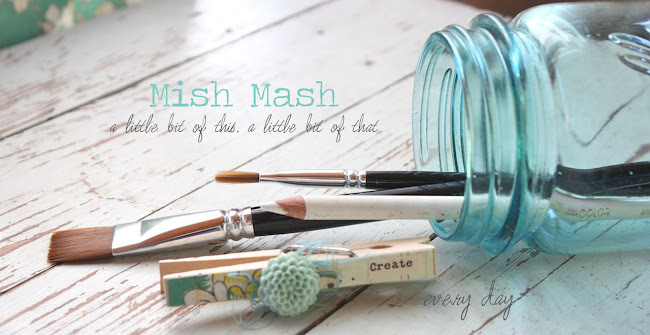 In this post I'm sharing a project that will be similar to lesson in the Close To Home class. You can get an idea of what the class has to offer, however all of the lessons in class will be in video format. I can't wait for it to begin on August 22nd. 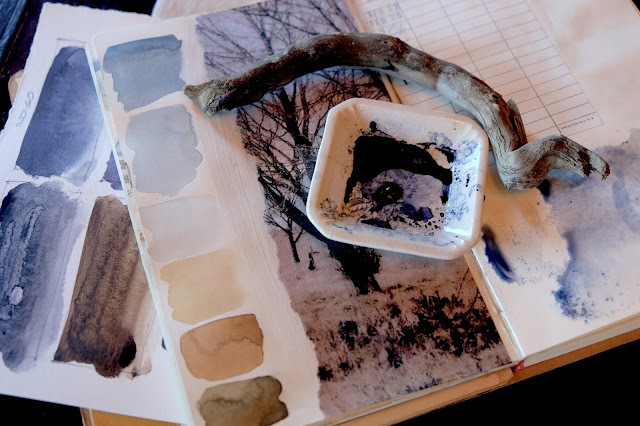 Experimenting with mixed media and watercolor can give some fun results. To get my creative juices flowing I like to sometimes get out my Dylusions journals and just have some fun. 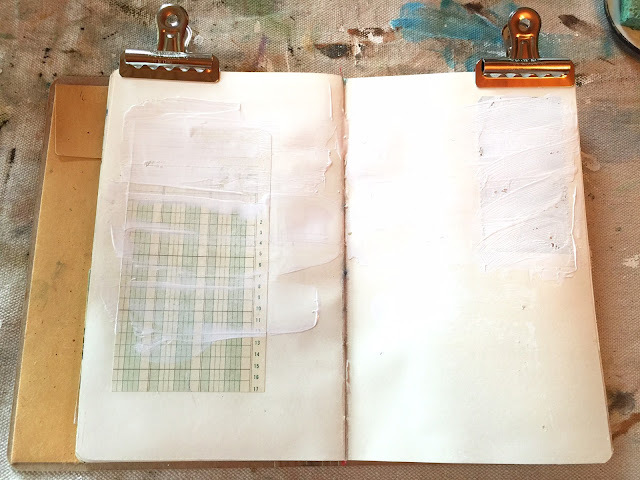 In this journal, I've prepared each page ahead of time with a piece of vintage paper, some gesso, etc. So every time I turn to a new page, I'm given a new challenge. 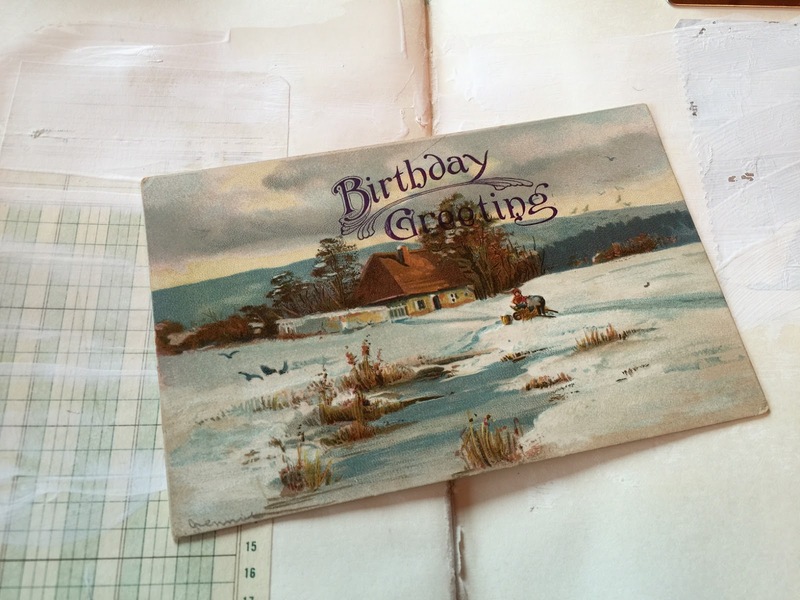 I collect vintage postcards and have noticed they offer some of the prettiest landscape scenes. So I've been incorporating them into my art lately. I started by adding a simple pencil sketch to my journal. 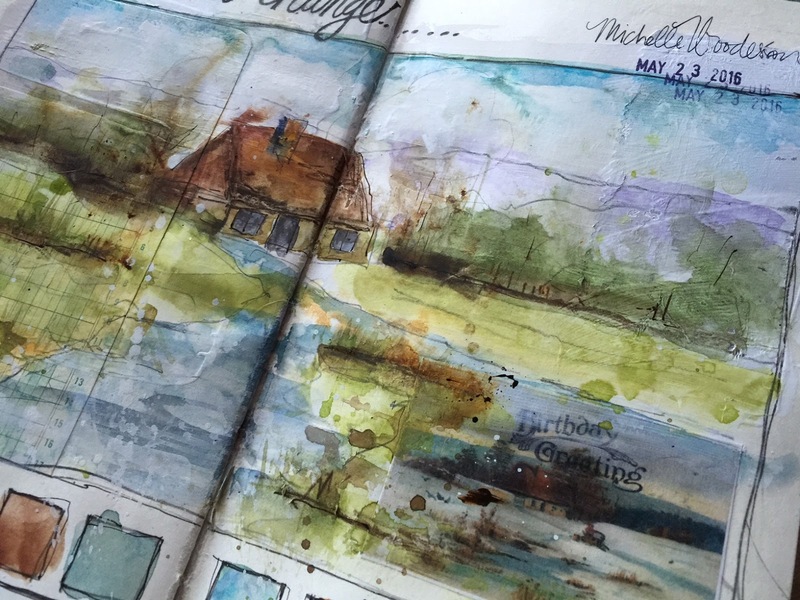 I don't plan anything ahead, I just let the art flow onto the pages as I dig through my supplies. Here I added some borders and some squares in ink. 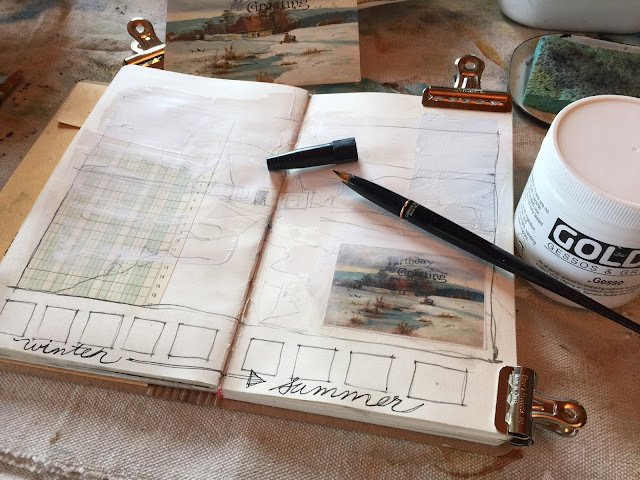 I switched my art page to reflect a summer scene instead of a winter scene as the postcard illustrates. 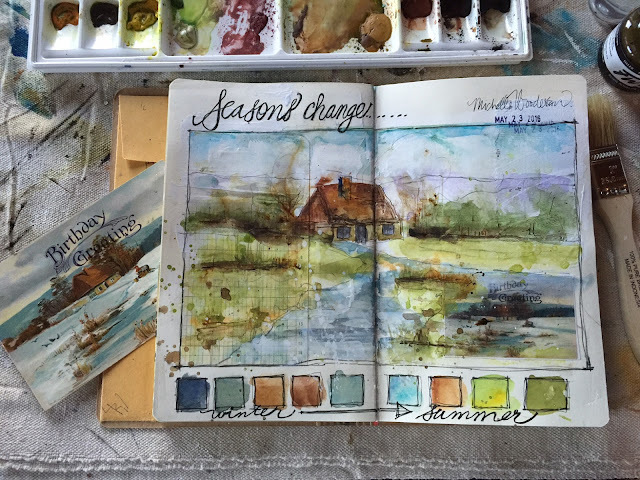 So on my pages, I painted winter colors and summer colors. 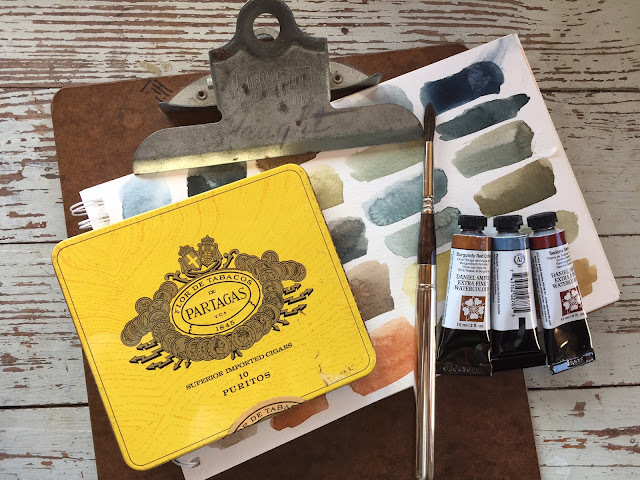 Here's a shot of my well used watercolor palette. We'll talk about supplies in both of my classes. The online class goes into more depth about supplies needed and how to set up a palette. Next up I just start adding watercolor. 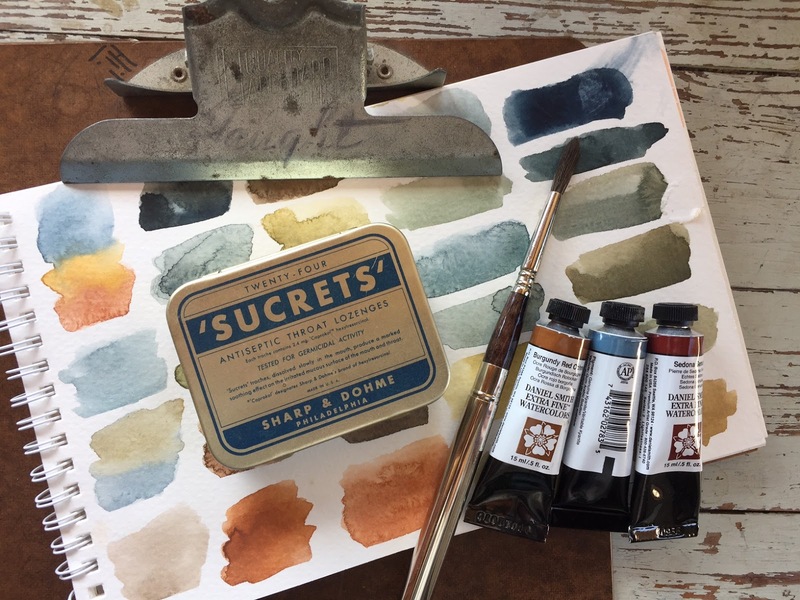 It's fun to experiment with watercolor to see how it goes down over other painted surfaces. 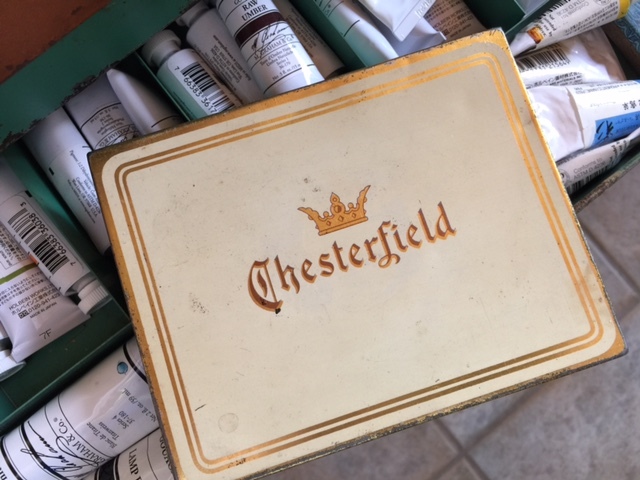 Here, it's applied over gesso and has a bit of resist to it. I just kept adding paint, looking for a few values, splattering, adding white paint, etc. I experimented with acrylic ink and a dip pen. Here is my final result. I love the thicknesses, the layers created by the vintage papers, the black ink and watercolors. Just a fun experiment and as these pages add up in my journal, they're sure fun to look at. Watercolors have captured my heart. There's just so much to learn. Getting back into my art has been so rewarding and satisfying. I hope you'll get creative with me and join in on a class. If you've wanted to start, my classes will be great starting points. If you've abandoned your art because you didn't think you were good enough or life got in the way, my classes are just for you. 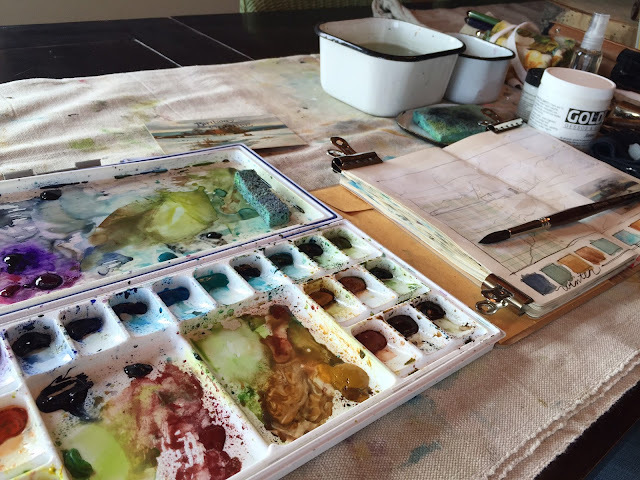 I want you to experience the joy of art and Jeanne's network of classes are just the ticket. 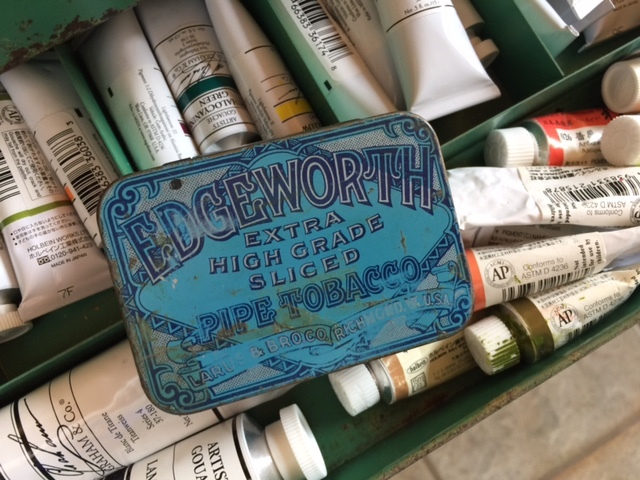 So much sharing and a great community of artists. I hope you'll join me. New classes, new shop items! Hey there, I wanted to provide a few updates of some fun happenings. My class Close to Home: A Watercolor Landscape Journey starts this month, August 22nd. You can register HERE. The count down is on and there is a lot of excitement buzzing around for this class. It's not too late to join in. 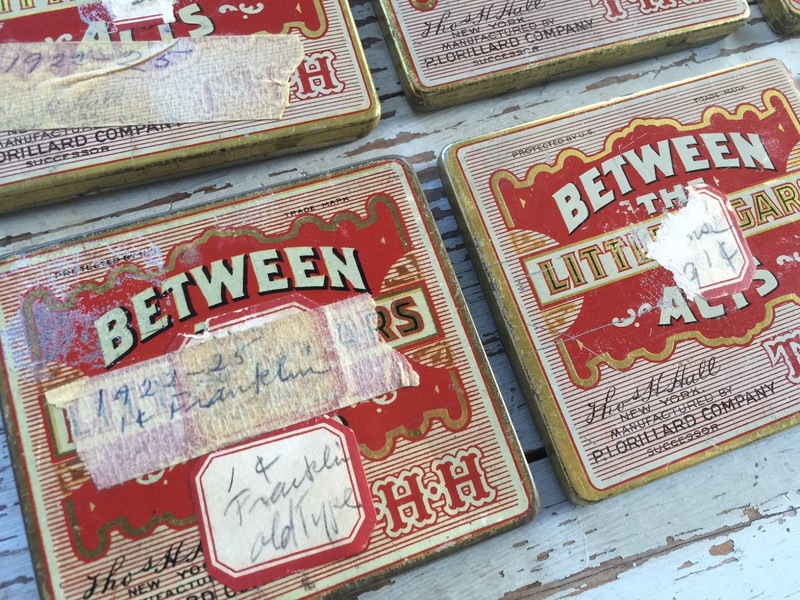 Details are on Jeanne Oliver's site HERE. 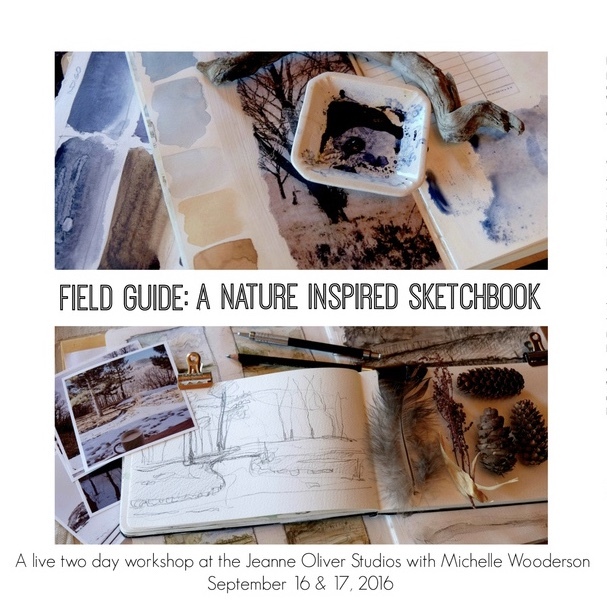 Also, I'll be teaching another new class at Jeanne's studio in beautiful Colorado! 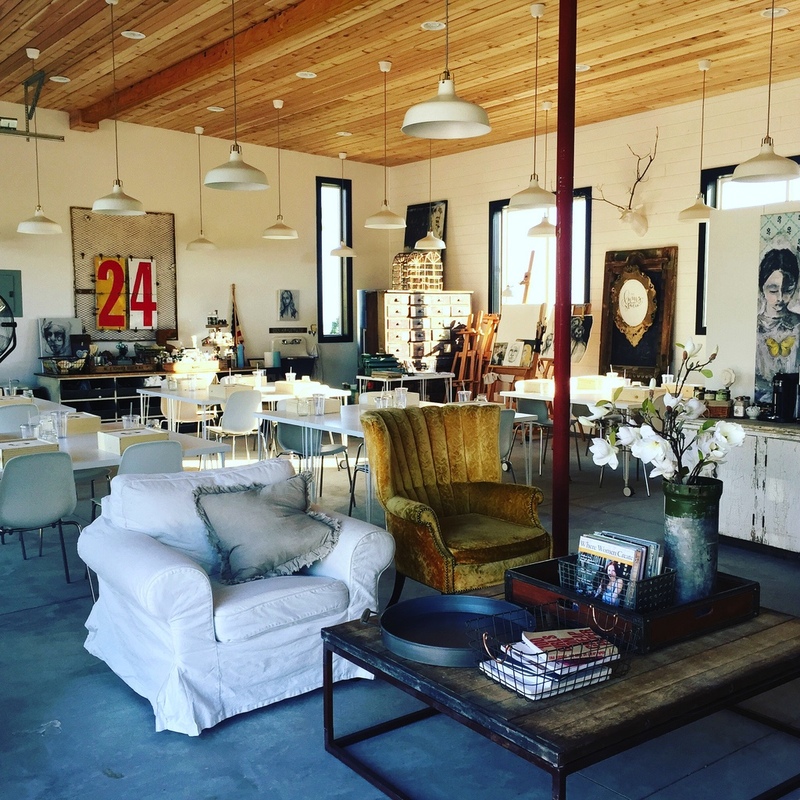 If you love art, travel and the great outdoors, this class is for you. 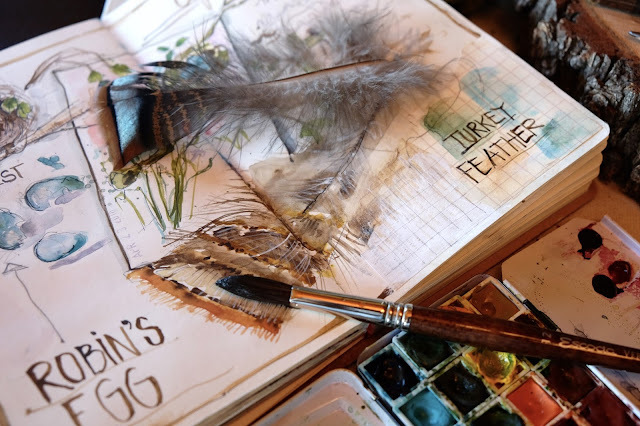 You can find out more about the class Field Guide: A Nature Inspired Sketchbook and register at the end of that post. We'll be nestled in for two days at Jeanne's beautiful home and studio in Colorado. Fall is a beautiful time in Colorado so it will be two days of pure heaven. 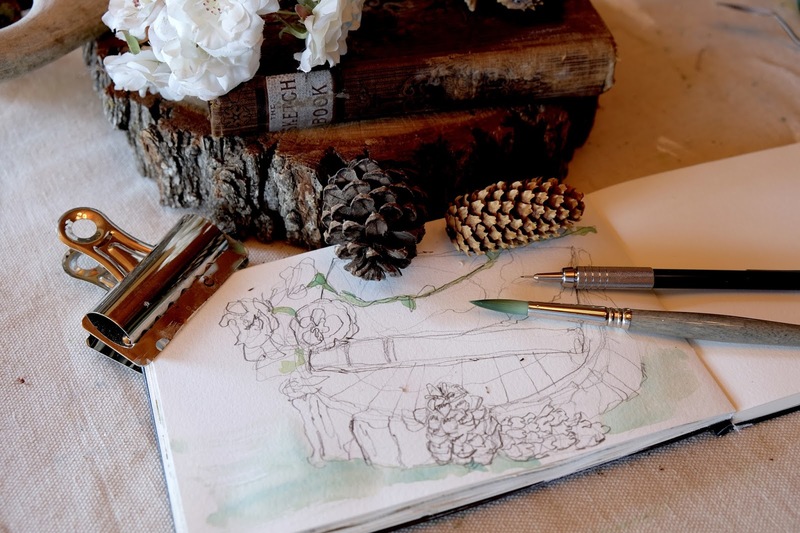 We'll learn the basics of drawing, learning from beautiful nature inspired still lifes. Nature will be our guide. We'll develop a wonderful color palette and learn about value and composition sketches. 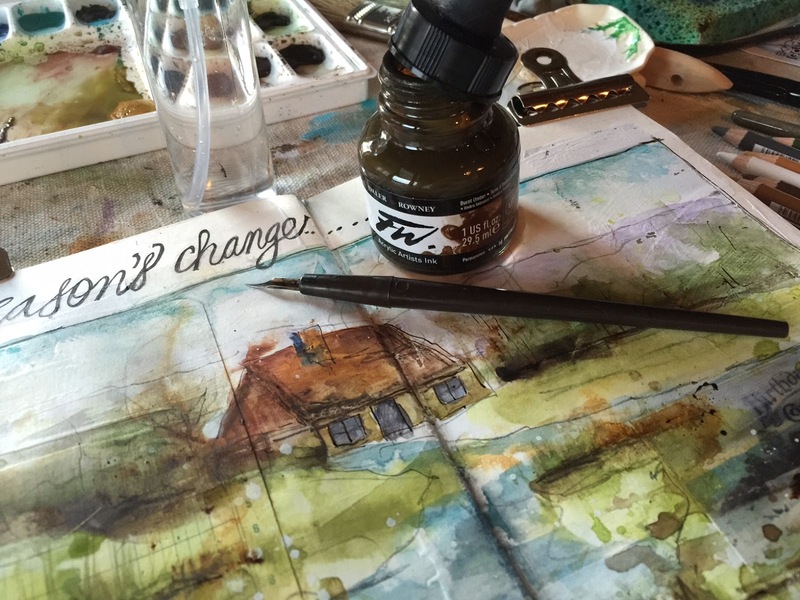 We'll touch on watercolor basics and learn about quick pencil sketching with watercolor washes added. 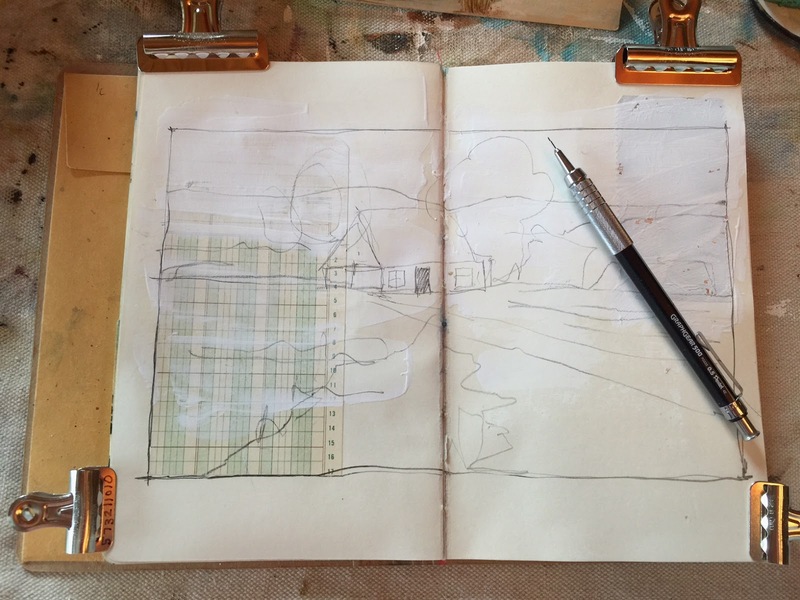 You'll get to practice your drawing skills and learn how to capture the essence of a scene. We'll touch on mixed media and how it can add so much to your watercolor sketches. It's all happening here in Jeanne's beautiful studio. We can't wait to pamper you! I hope you'll join us. If you're in need of watercolor palettes for either of my classes, I have some fun vintage travel palettes just added to my shop HERE. If you're looking for an art adventure, I hope you say yes. Yes to the journey. Yes to yourself. You deserve it! 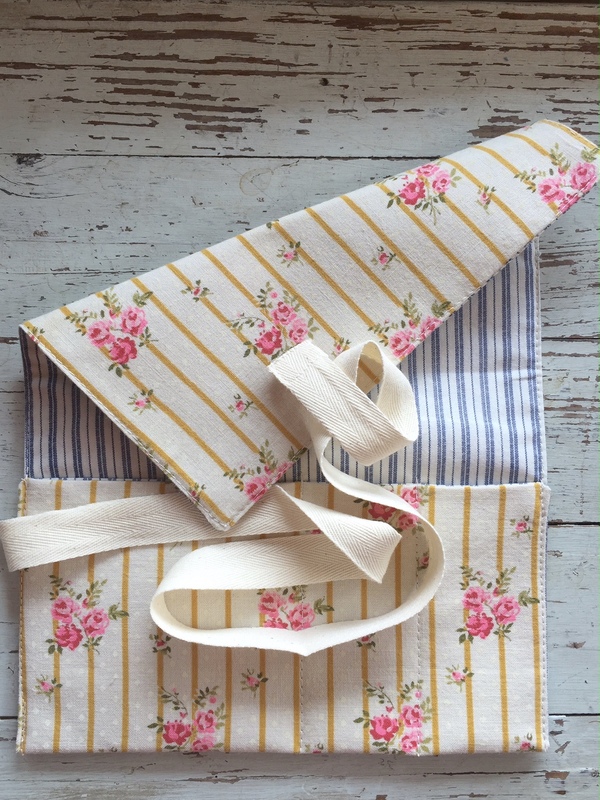 Hey guys, I've just listed some new items to use with your art in my shop. LINK IS HERE. 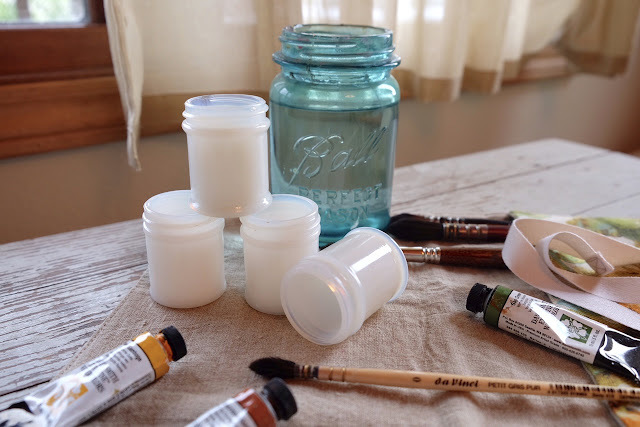 There are lots of fun little dishes that are perfect for mixing washes or for when you work with mixed media like Gesso. Most items are in the shop, a few will be added soon.